7 Days of Self-Care: Simple Ways to find Contentment in everyday life! This 7 Day Self-Care Challenge teaches you how to fit self-care into even the busiest of days! Self-care does need to be something special and out of the ordinary. But that doesn't mean it has to be complicated, time consuming or expensive. Last week in the Creativity Club we did a 7 day challenge to prove just how simple Self-Care can be. This little experiment also proved just how BIG an effect self-care can have on our energy. You are going to want to try this! We started out the week with my favorite: Water Therapy! Yes it's cold outside and maybe you don't live near a lake or ocean, but you can STILL experience water therapy pretty much for FREE! Water therapy is soothing and purifying, washing away dirt, dead skin, and negative emotions. This is a super simple way to show yourself you care and remove a layer of grunge that's smothering your energy. 2. Give yourself a foot soak. If you have epsom salt/ and or some purifying and soothing oils (Purification, Peppermint, Eucalyptus, etc) soak your feet in a tub or bucket of salty, oily hot water. Let us know in the comments below which of these you choose and the negative emotion you will wash away. Another simple way to take care of our body, mind, and spirit is to feed ourselves food that make a feel great. Foods that are easy to digest, giving us energy rather than using up energy just to process them. Think about how you feel after eating a bag of doritos or movie popcorn. Not great right? And that sense of discomfort and lethargy is a sign your body is diverting energy to digesting this food rather than to do things like think, heal, stay awake, etc. So today I challenge each of us to chose at least one meal to eat healthier than usual. 1. Maybe you usually forget to eat lunch. Step 1 would be to set a timer and eat something healthy. 2. Take away one of your stress "go tos" and replace it with fruit or veggies or a tall glass of water with some vitality oils. See how much better you feel than when you stress eat cookies. 3. Add a healthy snack somewhere in the day. A little treat you love but don't usually spend the time or money to make. I already have mine planned out. I like to drink a kombucha whenever I work at Trader Joes. Today I went to the corner store and got one to drink tomorrow. It will be fun to have this treat while I'm at home! Which easy option will you choose? Or do you have another healthy idea to share with us? Self-Care Challenge Day 3: Stretch Yourself! We stretch ourselves everyday. Mentally, Emotionally, Psychologically. Today I want you to take some time to stretch yourself physically. LITERALLY. Now each of us is at a different level of physical fitness. This is part of what makes each of our paths unique. When I was really struggling with my hypothyroidism, I was actually warned by my doctor not to exercise. My adrenals couldn't handle the added strain and an overload would worsen the strain on my thyroid. I tried going to yoga once. Felt great in the moment, and could barely get out of bed for the next 2 days. So I get it! Most of us need to start slowly. But each of us can do one of these three simple activities. 1. Sit comfortably in a chair and deep breathe. Concentrate on relaxing and expanding your lungs. You will increase the oxygen to your brain and all your cells, and you'll also release some built up tension. 2. Lie on the floor and pull your knees up to your chest. Pull your head down to your chest. Lie flat and allow your back to relax and sink into the floor. This is great for those of us with bad backs. Keeping those muscles gently loose can make a world of difference. 3. Combine breathing and stretching with some light yoga poses. With this self-care I don't really mean to exercise. I mean to gently wake up your body and give it a chance to relax and re-oxygenate. BONUS: Breathe in Eucalyptus, Peppermint, R.C. or Raven blend to further open your airways and boost the effects. Let us know which of these you chose and how it made you feel. Self-Care Day 4: Go Green. No I don't really mean Save the Environment, although I'm all for that too. I mean get into nature. I don't think I'll get much argument on the restorative and relaxing influence that nature has on us. But I do know it feels harder to enjoy nature once the weather starts to turn cold. Here are a few ideas to get creative and spend a little time with nature today. 1. Take a walk (Come one. You knew that was going to be one of the choices.) Bundle up and find a little patch of green or some beautiful changing leaves. Or, if your like me, you actually think the bare tree limbs are beautiful too. Take a couple photos on your walk if you get inspired. 2. Buy a plant, or spend a little time with the ones you already have. Water your plants. Talk to them a little. Tell them they look beautiful today. They deserve to be appreciated, and it will make you feel happier too. 3. Eat some greens. Have a salad for lunch today or add cooked spinach to dinner tonight. Get some of those vitamins and minerals in your system and let them restore you from the inside! Which one will you do? Or will you go all out and do 2 or 3 of these? Let us know in the comments below. Self-Care Challenge Day 5: Quiet Time. I wanted to get this one in here before your friends and relatives come to town for Thanksgiving. 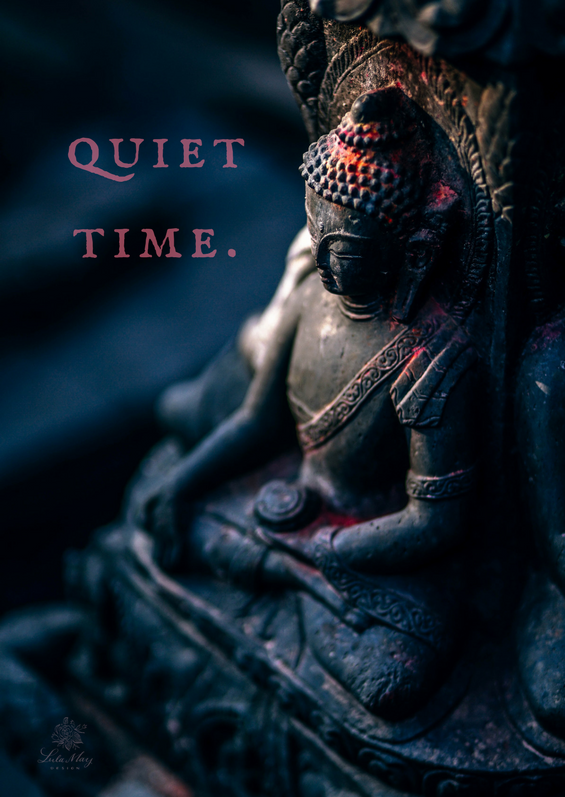 Sitting quietly is often associated with various religions. If you subscribe to a particular religious practice, then you will already understand the benefits of meditation, prayer, scripture reading, etc. But I truly believe we can all benefit from stilling our minds and allowing the worries of the day to slowly fade for 20 minutes. Here are some quiet activities you can try, if you aren't ready to adopt a standard practice. 1. Gratitude Journal. Y'all know I do this every single morning, and I know lots of y'all do to. How about spending 15 or 20 minutes this morning really writing down everything you can think of to be grateful for? See how much that calms your mind and encourages you to keep moving forward with life! 2. Read an inspiring book. I love to have a good book to read when I need a break from the computer. I love to read more about crystals and aromatherapy, but I also enjoy reading books by other coaches, business owners, and philosophers. Often I get sparks of ideas or have an unfinished idea suddenly click into place. It's a wonderful, energizing experience for sure! 3. Doodle. Grab a blank sheet of paper of print a coloring page from online. Allow yourself 20 minutes to do nothing but enjoying coloring or sketching. Don't even worry about what it will look like in the end. Just enjoy the repetitive motion and let your conscious brain rest. Which of these quiet activities will you try today? If it's one you haven't done in a while, let us know how it felt. Did it help you regain some mental energy for the rest of your day? Self-Care Challenge Day 6: Girl Talk. When was the last time you called an old friend or had a coffee date with one of your favorite people? What he means is that I'm happy sitting and thinking and learning. And if he didn't plan fun gatherings with our friends, I would probably be at semi-hermit status. Now I'm happy being alone, but I'm also energized when I get into a deep discussion with someone I respect and care about. It's also great to get some things off your chest. When you talk to someone who "gets you" you're able to receive great advice and give it in return. Two heads really are better than one, and I bet a little girl talk will help you let go of some frustrations and get excited about taking the next step on your journey! 1. Call a friend. Who's your favorite person that lives far away? Give them a call and catch up on what's going on in their life. 2. Lunch date. Yes you're busy. But you have to stop for lunch at some point. Think of a friend who's also super busy and plan a time to meet for a quick lunch. You both get a break, and you don't get stuck talking for hours because you both have a long to do list to accomplish. 3. Write an email. So if you are REALLY swamped (Look, it's almost thanksgiving. I totally get it.) send a quick email to a friend you haven't heard from in a while. Reopen that connection and make room for some great girl talk in the near future. Self-Care Challenge Day 7: Explore. This is the last day of our challenge. How has it gone for y'all so far? Did you do every day? Share some of the results with us in the comments! For Day 7 I saved the best for last! For some of y'all the idea of exploring is exciting. Others of you are scowling into your computer screen right now. I can feel it! Everyone take a deep breath. Remember we are talking about Simple Self Care! The holidays are here so it's likely you have relatives in town or you are traveling. Family gatherings tend to be about eating food and sitting on the coach in a half-daze. Let's shake things up a bit this year! Here are some ideas of how you can explore your world and bring your gusts along with you. 1. Go to a new shop or restaurant since the last time you were all together. Head downtown or go for a drive and chat about how things have changed over the years. Try to find one new thing you hadn't noticed before. 2. Try a new dish. Even if you always serve your traditional foods, throw in one quick side dish that you've never made before. It might be good. It might be a flop. But it's always fun to try something new. 3. Play one of those get-to-know-you games. They are all over the internet. Do a silly one, a thoughtful one, or an edgy one, whatever fits the vibe of your event. I bet you'll discover fun and interesting things about each other that you never would have learned just sitting in front of the tv or taking a nap. I'd love to hear how these 7 challenges help you make time for self-care in your daily routine. Leave me a comment below or shoot me a message. If you'd like to participate in more of our inspirational challenges join us in The Creativity Club. All the best stuff happens in my Facebook support group. If you don't want to miss out, that's where you want to be! Blessings and Wishes for the happiest of Holidays!